Agro-input dealers are often thought to be only interested in making money any way that is possible, otherwise known as “making a fast buck.” But enlightened dealers can combine the profit motive with a concern for customers’ well-being to earn their trust and make a business that lasts. 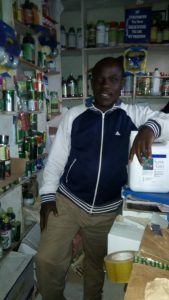 Richard Businge has a small shop in Fort Portal, Uganda, selling farm tools, seeds and other inputs. In 2016 Richard discovered that he could use farmer training videos to attract and keep customers. At university, Richard studied computer science and monitoring-&-evaluation. His first job, as part of a donor-funded project, taught him how hard it was for farmers to find quality inputs, so when the project ended, Richard started his own business. But competition was stiff. So once a month on market day Richard takes his two helpers and some goods in a taxi to one of six nearby towns, going every six months to each market. Small towns in Uganda always have at least one video hall, called a chivanda or bibanda, made of black plastic sheeting and light wood. Customers pay a few coins to watch a commercial movie, often an action film. Once everyone is seated, the chivanda door is closed and holes are patched to keep young boys from peeping in for free. Richard plays popular music for half an hour as people drift in, allowing them to take their places and not get too bored. He then plays a video which he has previously downloaded from Access Agriculture and stored on a USB stick. He simply plugs the memory stick into the chivanda’s movie player or laptop. After the first video, Richard takes questions from the audience before moving on to a second and finally, a third video. The videos only last about 15 minutes each, but with the question and answer sessions (and the music) Richard makes full use of the chivanda for three hours. Because Richard shows the videos for free, the chivanda door stays open all the time, and farmers come and go constantly. Just outside the chivanda door, Richard has a stall set up where his assistants sell goods, including some the farmers have seen in the videos, such as PICS bags (plastic bags for keeping insects out of stored beans and grain). Sometimes Richard shows videos on how to grow onions, which helps him to sell onion seed. A veterinarian colleague sets up a stand nearby and sells animal health products; having two allied businesses helps to attract more customers. Fielding questions gives Richard ideas for new topics that interest farmers. He then discusses these on a talk show he does on the radio every Saturday morning in the local language, Lutoro. Building a clientele gradually, sharing ideas and earning trust, may not be the fastest way to make a buck, but a business that serves the community and supports a family can be built on enlightened self-interest, sometimes with a little help from farmer learning videos. Yesterday in Mandera village in Tanzania, we were lucky to meet an inspiring young farmer. 32-year old Sadiki Mchama is an entrepreneur with passion and vision who left his office job to become a farmer. Across Africa, well-organised farms that produce for markets are often set up by older government officials who invest their savings into farming to provide a steady income after they retire. But Sadiki was clearly a different case, which triggered my curiosity. Until 3 years ago Sadiki worked as an accountant at the Water Supply and Sanitation Authority of the Wami River Basin. Once he had saved enough money, he decided to start his own farm. 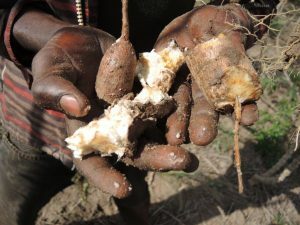 Sadiki started growing cassava on his 10 acres (4 hectares) of land. But some of the planting material he got from the open market was infested with disease, such as the cassava mosaic virus and the cassava brown streak disease. As he uproots some of the infested plants it does not take long to realise that infested plants yield no tubers. 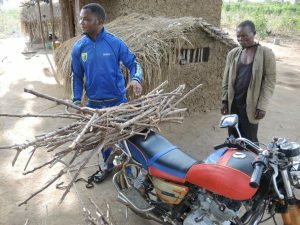 Eager to find a solution, Sadiki turned to the extension officer who introduced him to a project that tried to set up a cassava “seed” system, involving community “seed” producers. 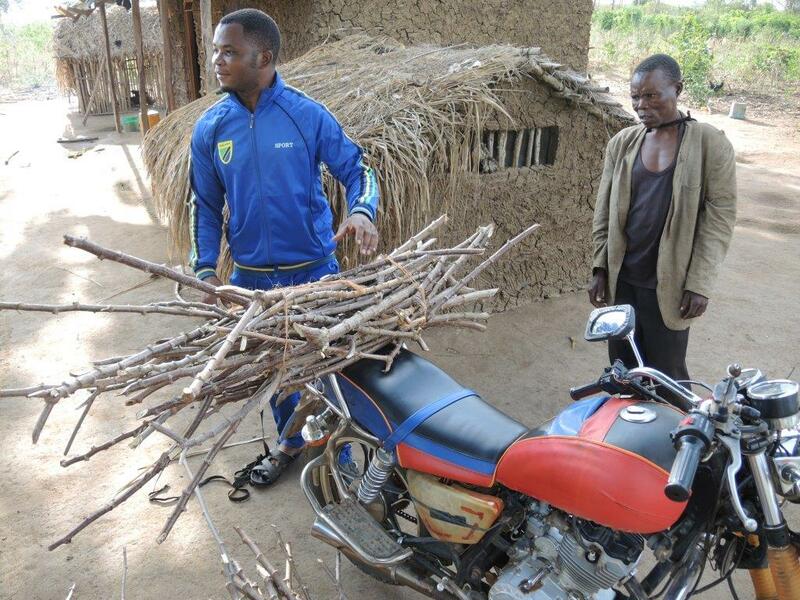 Sadiki successfully took the course, bought certified cassava planting material and planted it far from other fields, so the disease would not spread to his new crop. “When you start a business, you need to find customers and look after them so they come back to you,” Sadiki says. While many farmers struggle to find a market for their cassava roots, Sadiki did manage. He now rents a car and brings his produce to the customers however far away they are. Sadiki is a people person. His open, smiling face radiates with positive energy. As we were filming a video on healthy cassava planting material, we were pleased to include him. In farmer training videos, enthusiastic people like Sadiki communicate ambition and show what is possible. Once our video on quality cassava planting material is posted on the Access Agriculture video platform, Sadiki plans to download the video and share it with his network. The video in turn may help to boost his business, the same way that vegetable training videos in Uganda boosted the demand for tomato, chilli and onion seed. Young people across Africa are starting to see opportunities in agriculture. And they cleverly combine their great interpersonal skills with new ICTs and social media. When Francisco Condori stopped working as a bricklayer in La Paz, Bolivia, he returned as a 23-year old to his home village of Cutusuma, near Lake Titicaca. He felt that because of his years in the big city he was missing some agricultural knowhow. So he consulted with the older people of Cutusuma. 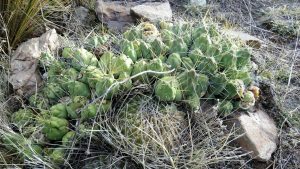 More than anything, the elders taught Francisco what are now called “the indicators” that is, the signs of nature that tell when to plant and if it will be a good year. This is indispensable information in a place like the Altiplano, generally good land for farming, but sometimes hostile. Frost, hail and drought can destroy crops at any time. That is why forecasting the weather is a specialty on the Altiplano. For example a bird, the quiri quiri, makes nests like little ovens in the totora reeds of Titicaca and the small lake of Cutusuma. The bird seems to know how high the water will rise. In dry years it builds its nest low, and in rainy years it makes a nest high on the totora plant. Francisco learned to take a raft into the lake and seek out the nests. The height of the nest in the dry season indicates the level that the water will reach in the rainy season. Don Francisco also learned to look for the sank’ayu cactus. If it bears fruit early, one should plant potatoes early, in October. If it fruits late, one should plant in November. Besides looking for his own indicators, Francisco also listened to the weather forecast on the radio and on the TV, but it wasn’t always reliable. He and his friend Antonio remember that once the radio announced that there was going to be a frost and the farmers should “take care of their potato crop.” Francisco and Antonio just laughed, because it was June—winter and the dry season—and nobody had potatoes in the field. In 1998 Francisco met Edwin Yucra, an agronomist with an interest in climate and in local knowledge. 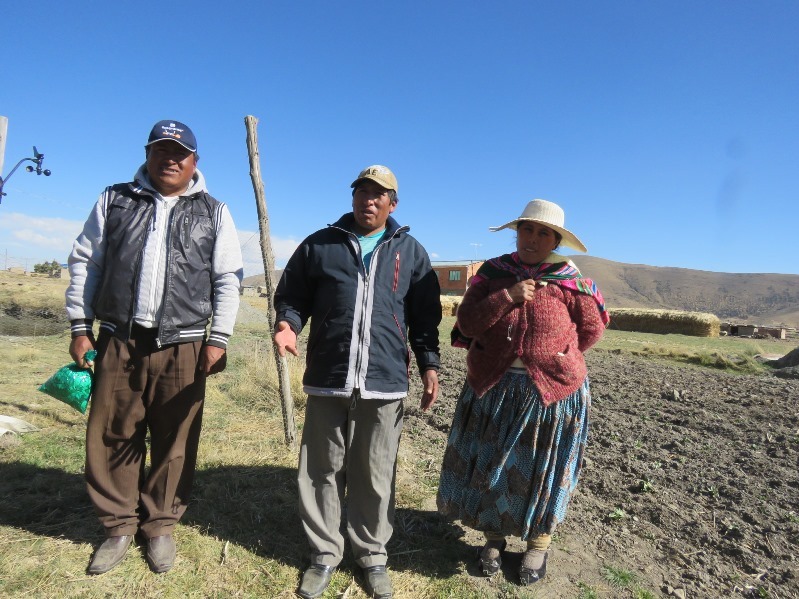 Edwin worked in Prosuko, a project that was supporting the development of sukukollus (planting beds inspired by the agriculture of the ancient civilization of Tiwanaku). Edwin collaborated for years with Francisco and Antonio and their neighbors. In recent years, Edwin taught them that there was a free app on the Internet that farmers could download to predict the weather with the help of satellites and weather stations. Many farmers have smart phones nowadays which give them access to apps like this one, called Weather Underground. By 2017 Edwin, now a professor at the Public University of San Andrés, worked in seven communities, including Cutusuma. They managed to build a small weather station in Cutusuma to register the weather, including temperature, wind and rain. Francisco and Antonio go over the data from the station constantly. They log onto Weather Underground every day on their cell phones. They still listen to the forecast on the radio and on TV and they still make their own forecast based on the indicators, which their write on their Pachagrama (see blog story Predicting the weather), so they can track the weather over the year. Don Francisco and don Antonio are conducting a deep study of the weather. They combine local knowledge with modern science. Thanks to this, Francisco has become a sort of expert and celebrity. His neighbors frequently ask him what the weather will be like. When don Francisco goes to market in the town of Batallas, the people there recognize him and ask him about the weather. In recent years Francisco has appeared on several TV channels explaining the weather, the indicators and describing climate change. It is an example of how one can respect local, even ancestral knowledge, while still appreciating modern science. Cuando don Francisco Condori dejó de trabajar como albañil en La Paz, Bolivia, volvió a sus 23 años a su aldea natal de Cutusuma, cerca del Lago Titicaca. Sintió que debido a sus años en la gran ciudad le hacía falta saber de la agricultura. Así que se fue consultando con la gente mayor de Cutusuma. Los ancianos más que nada le enseñaron a Francisco lo que se llaman los “indicadores” o sea los señales de la naturaleza que dicen cuándo sembrar y si va a ser un año bueno. 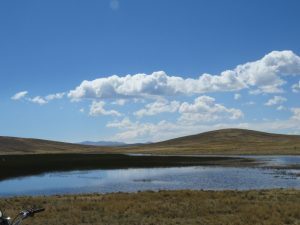 Esa información es indispensable en un lugar como el Altiplano, tierra productiva para el agro, pero a veces también hostil. Heladas, granizadas y sequías pueden destruir los cultivos en cualquier momento. Por eso el pronóstico del tiempo es una especializad en el Altiplano. Por ejemplo, una pájaro, el quiri quiri, hace sus pequeños nidos como hornito en las totoras de Titicaca y de la pequeña Laguna de Cutusuma. El pájaro parece que sabe dónde llegará el agua. En años secos hace su nido bajo, y en años lluviosos hace su nido en la parte alta de la planta de totora. Francisco aprendió a entrar en balsa a la laguna y buscar los nidos. La altura del nido en la época seca indica el nivel que el agua llegará en la época lluviosa. Don Francisco también aprendió a revisar el cactus sank’ayu. Si daba fruto temprano habría que sembrar la papa temprano, en octubre. Si daba su fruto tarde, habría que sembrar en noviembre. Además de buscar sus propios indicadores, Francisco también miraba el pronóstico de tiempo en la radio, y en la tele, pero no era siempre confiable. El y su amigo Antonio recuerdan que una vez la radio anunció que iba a haber helada y que los agricultores deberían “cuidar su papa.” Francisco y Antonio solo se reían, porque era junio—invierno y época seca—y nadie tenía papa sembrada. In 1998 Francisco conoció a Edwin Yucra, ingeniero agrónomo con interés en el clima y el conocimiento local. Edwin trabajaba en Prosuko, un proyecto que apoyaba en desarrollar a los sukukollus (camellones agrícolas, inspiradas por el agro del antiguo imperio de Tiwanaku). Edwin colaboró durante años con Francisco y Antonio y sus vecinos. Edwin, en los últimos años, les enseñó que había una aplicación gratis en el Internet que los agricultores podrían bajar y pronosticar el tiempo en base a satélites y estaciones meteorológicas. Muchos agricultores tienen smart phones hoy en día que les da acceso a estas aplicaciones como este, llamado el Weather Underground. Para el año 2017 Edwin, ahora catedrático en la Universidad Mayor de San Andrés, trabajaba con siete comunidades, incluso Cutusuma. Lograron poner una pequeña estación meteorológica en Cutusuma para medir el tiempo, como la temperatura, viento y lluvia. Francisco y Antonio revisan los datos de la estación constantemente. Chequean el Weather Underground cada día en sus celulares. Siguen escuchando el pronóstico en la radio y la tele y todavía hacen su propio pronóstico en base a los indicadores, lo cual apuntan en su Pachagrama (vea blog sobre Prediciendo el tiempo), para seguirlo durante el año. Don Francisco y don Antonio están haciendo un estudio profundo del clima. Combinan el conocimiento local con la ciencia moderna. Gracias a eso Francisco se ha convertido en una especie de experto y celebridad. Sus vecinos frecuentemente le preguntan cómo va a ser el tiempo. Cuando don Francisco va al pueblo de Batallas para hacer mercado le reconocen los del pueblo y le preguntan sobre el tiempo. En los últimos años Francisco ha salido en la tele y en varios de los canales explicando el tiempo, los indicadores y que el clima está cambiando. Es un ejemplo de que se puede respetar el conocimiento local y hasta ancestral, con amor a la ciencia moderna. Colleagues from the Public University of San Andrés in La Paz have been teaching groups of farmers to use a free app called Weather Underground, which allows users to forecast the weather in their location. This week my colleagues wrote a fact sheet for farmers on how to use Weather Underground. I went with one of the agronomists, Alex Borda, to validate his fact sheet in the farm community of Choquenaira, on the Bolivian Altiplano. Young farmers in Bolivia have smart phones, and like young people in the city, they use Facebook and other applications. So, farmers should be eager to download and use apps from the web to predict the weather, which is so important for agriculture. First we met with Pascual Choque, 80, who was sitting with his friends in the shade of a large stack of bricks. Don Pascual was born at a time when many rural communities lived in the semi-slavery of the haciendas, large farms managed by powerful landlords. The Revolution of 1952 brought many social changes and new freedoms, including access to education and information. Don Pascual went to school, became a teacher and now, among other things, works in a radio station. He interviews agronomists and PhDs on his morning show, broadcast at five o’clock, when rural people are eating breakfast and listening to the news. Alex read the fact sheet with some other farmers, but they also struggled to make sense of the text. It had unfamiliar terms like “click”, “select an option” and “close the app”. I started to feel frustrated, just like Alex. I have helped to validate many fact sheets and this was the first time that the people said that they understood almost nothing. We kept walking until we reached a small station of the Agricultural School of the Public University of San Andrés. 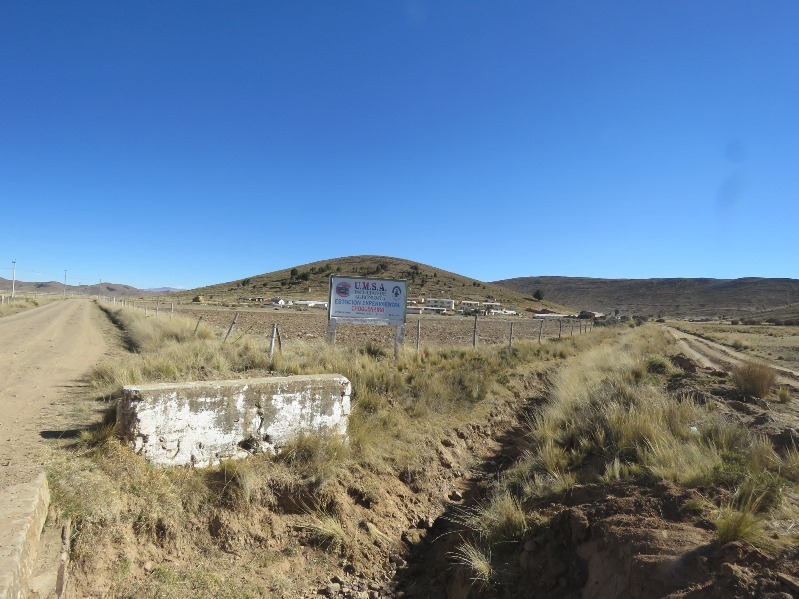 I was surprised find this outpost in the immensity of the Altiplano, with no houses nearby. The station was small—some llama corrals, tractors and sun burnt buildings and there were few people around. We managed to speak with some professors. As we were about to leave I saw two young women dressed in work clothes. They were agronomy students. “Let them read your fact sheet” I suggested to Alex. He came back pleased a few minutes later. The students liked his fact sheet and said that “there was nothing difficult to understand about it”. The youth understood his fact sheet. They have smart phones, and know how to discuss these magical pocket computers. Today from the Andes to Africa one hears that the youth are leaving the countryside. To attract the ones who are staying, it will be necessary to try new digital options to help manage agricultural information. The older generation took advantage of the new technology of their times, like schools and radio. This generation is also looking for new information technologies, even some that support agriculture. I have little doubt they will be interested in a free way to predict the weather using their cell phones. Compañeros de la Universidad Mayor de San Andrés en La Paz han estado enseñando a grupos de agricultores a usar una aplicación gratis llamada el Weather Underground, que permite a los usuarios pronosticar el tiempo para su ubicación. Esta semana mis colegas han escrito una hoja volante sobre para agricultores sobre cómo usar el Weather Underground. Fui con uno de los ingenieros, Alex Borda, a validad su hoja volante en la comunidad campesina de Choquenaira, en el Altiplano de Bolivia. Los jóvenes campesinos en Bolivia tienen smart phones, e igual que en la ciudad, usan Facebook y otras aplicaciones. Entonces, a los campesinos les debería gustar bajar y usar aplicaciones del web para pronosticar el tiempo, ya que la agricultura depende del clima. Primero nos encontramos con Pascual Choque, de 80 años, sentado con sus amigos en la sombra de un gran bulto de ladrillos, para construir una nueva casa. Don Pascual nació cuando muchas comunidades rurales vivían en la semi-esclavitud de las haciendas, fincas grandes manejadas por poderosos terratenientes. La Revolución del 1952 trajo muchos cambios sociales, incluso el acceso a la educación y la información. Don Pascual asistió al colegio y llegó a ser docente y, entre otras cosas, trabajó en una radio. El se entrevista con ingenieros y doctores en su programa por la mañana, a las 5, cuando la gente rural desayuna y escucha las noticias. Alex leyó su hoja volante con otras campesinas, pero tampoco entendían muy bien la hoja volante. Tenía vocabulario desconocido como “hacer clic”, “seleccionar una opción” y “cerrar la aplicación”. Yo empecé a frustrarme, junto con Alex. He acompañado a muchas hojas volantes y esa era la primera vez que la gente decía que no entendía casi nada. Seguimos caminando hasta llegar a la pequeña estación de la Facultad de Agronomía de la Universidad Mayor de San Andrés. Era para mí una enorme sorpresa ver la estación en la inmensidad del Altiplano, pero no había más casas. La estación era pequeña—unos corrales de llama, tractores y edificios tostados por el sol. Había poca gente. Logramos hablar con algunos profesores. Estábamos pot irnos cuando vi a dos jóvenes vestidas en ropa de trabajo. Eran estudiantes de agronomía. “Que ellas lean tu hoja volante” sugería a Alex. El volvió unos minutos después todo contento. A ellas les gustó la hoja volante y dijeron que “no tenía nada difícil de entender”. Las jóvenes entendían su hoja volante. Ellos tienen teléfonos inteligentes, y saben discutir esas computadoras de bolsillo. Hoy en día desde los Andes hasta Africa se oye que todos los jóvenes quieren abandonar el campo. Para atraer a los que quieren quedarse, será necesario probar nuevas opciones de tecnología digital para manejar información agrícola. Sus abuelos aprovecharon de las nuevas opciones de sus tiempos, como el colegio y la radio. Esta generación también busca nuevas tecnologías de información, incluso para el apoyo del agro. Les debe interesar una forma gratis de pronosticar el clima con su celular. Juan Almanza is an agronomist who works with seventy mothers, some single and some married, in three rural communities around Colomi, Cochabamba. Juan teaches them new ways to grow nutritious food, especially two legume crops: broad beans (introduced from Europe centuries ago) and the native lupin. The program is in its third year. Last year Juan helped each of the three groups of women to plant a demonstration or learning plot. 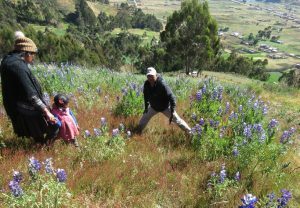 Juan had two new ideas to showcase: two new varieties of sweet lupins that did not have to be soaked and washed to leach out their toxins, and second, planting the whole plot (a small field) with lupins. Previously farmers planted them in a single row along the borders around a potato field. The learning plot is an idea that Juan adopted from his earlier work with farmer field schools. The women have enjoyed the meetings and appreciated that the sweet lupins can be used in recipes that would be impossible with bitter varieties. The women have made hamburgers, soups and have boiled the lupine beans fresh, to eat like peas. The women have collected 18 recipes which Juan has written up. Some husbands have resented the time that the women spend at the meetings, because it distracts them from farm work. Some wives quit attending. Juan realized that to keep the women in the group it was important that they receive tangible benefits which they could show to the rest of the family. So this past planting season Juan gave each woman an arroba and a half (about 18 kilos) of broad bean seed, of a new variety from La Paz, and two or three kilos of lupin seed. Juan showed each group a video on lupins, filmed partly in Colomi, but mostly in Anzaldo, in another province of Cochabamba, where farmers already grow lupins in small fields, not just around the edge. 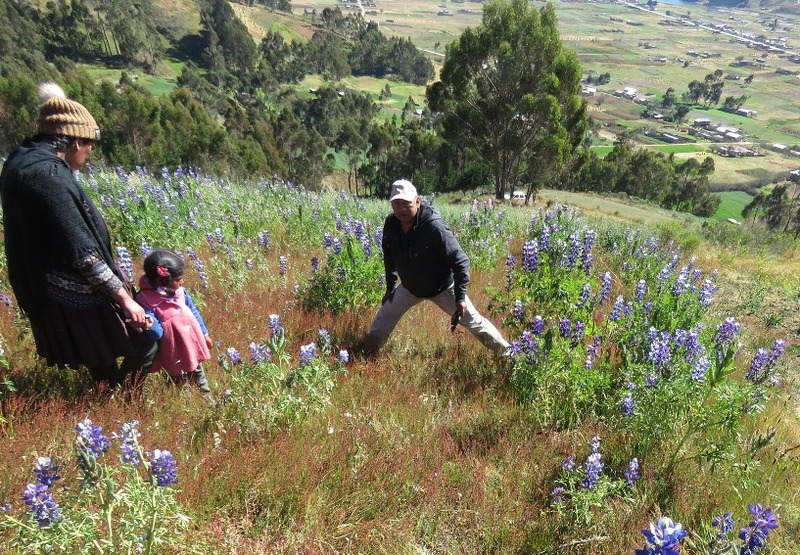 Juan is a skilled agronomist and perfectly capable of teaching about lupins, but trying new varieties and planting them in a new way requires some extra inspiration. Seeing real farmers on the video, successfully growing lupins, gave the women the encouragement they needed. They all planted the lupins Juan gave them. Juan and I caught up with some of the lupin farmers at the fair, held twice a week in Colomi, where farmers come to sell their produce and to buy food and clothes. Many of the busy mothers from Juan’s groups are retailers two days a week, and farmers on the other days. As she tends a stall of grains and other dried foods, Marina explains that before they met Juan, some farmers did grow the lupins in whole fields, but they would plant them in furrows a meter apart. The new varieties are much shorter and have to be planted closer together. The video showed how to do this. Reina Merino was unpacking her bundles of clothing in her small shop. 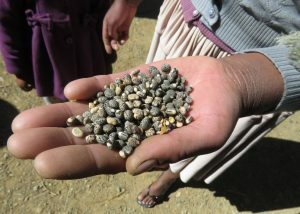 She said that now the women plant lupins “like potatoes,” that is, in furrows, close together, and the farmers now take the trouble to weed the crop. Weeding was also an innovation. Previously lupins would just be planted and left alone until harvest time. Unfortunately, the women’s hard work did not pay off. This past year the rains were delayed, and then it rained far too much. Some people harvested half of the lupins they were expecting; others reaped almost nothing. Given the disappointing results, I asked Reina if she would plant lupins again. “Of course we will! !” she said. He plans to show the lupin video again to all of his groups. Juan Almanza is a dedicated, respected extension agent who uses video as one of several tools, along with talks, experimental plots and visits to farmers’ fields. He realizes that showing the video a second time will reinforce what these farmers have already learned. Hopefully the weather this year will repay their efforts. Our work in Bolivia is funded by the McKnight Foundation’s CCRP (Collaborative Crop Research Program). Juan Almanza works for the Proinpa Foundation. Juan Almanza es un agrónomo que trabaja con setenta madres, algunas solteras y otras casadas, en tres comunidades rurales alrededor de Colomi, Cochabamba. El Ing. Juan les enseña nuevas formas de cultivar alimentos nutritivos, especialmente dos leguminosas: habas (introducidas desde Europa hace siglos) y el tarwi (lupino, chocho o altramuz) nativo. El programa está en su tercer año. El año pasado, el Ing. Juan ayudó a cada uno de los tres grupos de mujeres a sembrar una parcela de aprendizaje. Juan tenía dos nuevas ideas para mostrar: dos nuevas variedades de tarwi dulces que no tenían que ser remojados y lavados para quitar sus toxinas, y segundo, sembrar toda la parcela con tarwi. Anteriormente, las agricultores los sembraban en una sola fila alrededor del borde de la parcela de papas. La parcela de aprendizaje es una idea que el ingeniero adoptó de su trabajo anterior con las escuelas de campo para agricultores. Las mujeres han disfrutado de las reuniones y han apreciado que el tarwi dulce se puede usar en recetas que serían imposibles con las variedades amargas. Las mujeres han hecho hamburguesas, sopas y han hervido los tarwis frescos para comer como arvejas. Las mujeres han recogido 18 recetas que Juan ha redactado. Algunos maridos no están de acuerdo con el tiempo que las mujeres pasan en las reuniones, porque les distrae del trabajo agrícola. Algunas esposas han dejado de asistir. El Ing. Juan se dio cuenta de que para mantener a las mujeres en el grupo era importante que recibieran beneficios tangibles que pudieran mostrar al resto de la familia. Así que en esta última campaña, Juan les dio a cada mujer una arroba y media (unos 18 kilos) de semilla de haba, una nueva variedad de La Paz y dos o tres kilos de semilla de tarwi. Juan mostró a cada grupo un video sobre altramuces, filmado en parte en Colomi, pero principalmente en Anzaldo, en otra provincia de Cochabamba, donde los agricultores ya cultivan tarwi en pequeñas parcelas, no solo alrededor del borde. Juan es un agrónomo hábil y perfectamente capaz de enseñar sobre el tarwi, pero probar nuevas variedades y plantarlas de una nueva manera requiere algo de inspiración adicional. Ver a agricultores reales en el video, cultivando tarwi exitosamente, les dio a las mujeres el aliento que necesitaban. Todas sembraron el tarwi que Juan les dio. El Ing. Juan y yo conversamos con algunos de los productores de tarwi en la feria, que se realiza dos veces a la semana en Colomi, donde los agricultores vienen a vender sus productos y comprar comida y ropa. Muchas de las madres de los grupos son minoristas dos días a la semana, y agricultoras en los otros días. Mientras ella cuida un puesto de granos y otras comidas secas, Marina explica que antes de conocer a Juan, algunos agricultores cultivaban el tarwi en parcelas enteras, pero lo sembraban en surcos a un metro de distancia. Las nuevas variedades son mucho más cortas y deben plantarse más cerca. El video mostró cómo hacer esto. Reina Merino estaba desempacando sus paquetes de ropa en su pequeña tienda. Ella dijo que ahora las mujeres plantan tarwi “como papas”, es decir, en surcos, más cerca, y que ahora se toman la molestia de carpir (desmalezar) la cosecha. La carpida también fue una innovación. Previamente, el tarwi se sembraba y se dejaba hasta el momento de la cosecha. Infelizmente, el trabajo duro de las mujeres no dio resultado. El año pasado, las lluvias se retrasaron y luego llovió demasiado. Algunas personas cosecharon la mitad del tarwi que estaban esperando; otras no cosechaban casi nada. Dado los decepcionantes resultados, le pregunté a Reina si plantaría tarwi de nuevo. “¡ Obvio que este año lo vamos a hacer otra vez!” dijo. Él planifica mostrar el video del lupino nuevamente a todos sus grupos. Juan Almanza es un extensionista dedicado y respetado que usa el video como una de varias herramientas, junto con charlas, parcelas de aprendizaje y visitas a campos de agricultores. Se da cuenta de que mostrar el video por segunda vez reforzará lo que estas agricultoras ya han aprendido. Esperemos que el clima de este año acompañe sus esfuerzos. Nuestro trabajo en Bolivia es auspiciado por el CCRP (Programa Colaborativo para la Investigación de los Cultivos) de la Fundación McKnight. Juan Almanza trabaja para la Fundación Proinpa.